Posted on 06 February 2012. Madonna showed us once again why she is still a powerful force in the music industry with one of the best Superbowl halftime shows in recent history. Music had a new upbeat feel and a dance on a wire that wowed the crowed. The new beat was was soon turned into a remix and she was joined by LAMFAO. They joined her center stage and Music got a surprising remix. 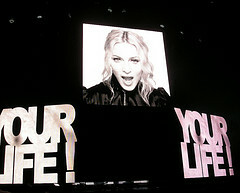 Madonna showed that she can keep up, because even Madonna shuffles everyday. After Music Madonna grabbed some pom-poms and went right into “Give Me All Your Luvin.” She suprised us yet again when Niki Manaj showed up with the assist. The song ended with a halftime drum line. Just when we thought it could not get any better Madonna and everyone on stage was in choir robes. The world held it’s breath as she began one of her most popular songs “Like A Prayer” She was joined by Cee Lo and the two sang it in front of a full choir and made everyone remember why this was one of her best songs. If you keep performing like that Madonna, everyone will be inspired to create world peace. Tabatha Ann - who has written 92 posts on Your Daily News Fix. © 2012 Your Daily News Fix.